I once head-butted a tree. It was an accident, of course. I don’t make a habit of getting into biffo with plants. Unless they drop leaves into my yard, in which case they started it and all bets are off. No, on this occasion I was busy texting when I walked straight into the damn thing. Interestingly, it happened on the same morning that I’d made a joke in a national newspaper about nature. Right there is what’s called Karma, ladies and gentlemen! Anyway, after my encounter with nature’s muscle, I regained consciousness and continued to the shops, wherein I wandered around chatting to sales staff and having a fine old time. It was only when I got home hours later that I discovered a leaf had been stuck to my face the whole time. This sort of thing happens to me a surprising amount. I march through life with something amiss on me somewhere. Sometimes it’s leaves, sometimes it’s cobwebs, but usually it’s food. I don’t know how it happens. I’m not a crazy, fast eater. I take my time, use the requisite cutlery, and almost always manage to get the fork successfully into my mouth. But somehow or other evidence of my meal winds up on me somewhere. Either sauce spills down my front, food lands in my lap, or stray bits fly off and stick to me – only to be discovered many hours later, of course. On one proud occasion, I made it to the end of my working day before noticing some lunch clinging like a limpet to the front of my shirt. I’d just been in a meeting where I suspect everyone was too embarrassed to tell me. Or perhaps they thought it was some kind of avant-garde, lettuce brooch. Another time my mother-in-law casually leaned over to retrieve food from my hair. I can’t remember what the exact food was because I was quite drunk. I was quite drunk because I was AT A WEDDING. 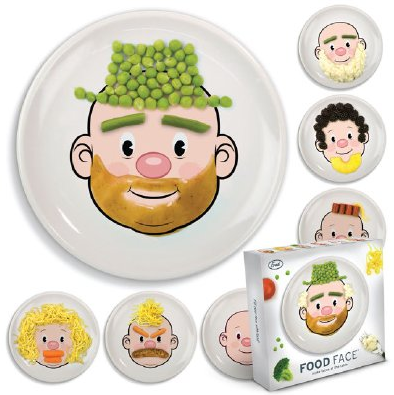 They’re called ‘Food Face’ plates. I thought about buying one for Mr Squish, but he already has the real-life model in his life. I don’t want to spoil him. ‘PEA – Pathetic Eaters Anonymous’, perhaps?